Being able to deliver an effective business presentation is essential to being able to progress in one’s career. In almost every type of career setting, the time will come for most people in which they will be expected to deliver a presentation. Whether it is to sell a product, conduct a training seminar or just to explain a new procedure, it is important for the person who is delivering the presentation to be able to capture the attention of their audience while also explaining the main points of their presentation. Because public speaking does not come naturally for most people, it can be helpful to review the following important tips for delivering an effective business presentation. It is important to never try to deliver an impromptu business presentation as a person’s lack of preparation will be obvious to the audience. Therefore, the presentation should be carefully planned, and then practiced as much as possible before the day that it is to be delivered. Many successful public speakers have been known to practice giving their presentation to family, friends and anyone else who would be willing to listen. Another popular idea is for a person to make a videotape of themselves delivering the speech that they can review afterward. A huge factor in a presentation’s success lies within the confidence of the speaker. Therefore, it is important to stand up straight and make eye contact with the audience throughout the speech. It is also important to speak from memory as much as possible while referring to slides or notes only when it is necessary to keep on track. This way, the speaker will come across as knowledgeable about their subject. Visual aids are important for helping an audience to focus their attention throughout a presentation. However, too many slides or images in a presentation can be distracting. Therefore, each slide should represent several main points that have been grouped together according to topic. The slides should only contain a few lines of text so that the speaker’s words are the main focus of the presentation. For some people, delivering a presentation can be a nerve wracking experience. Even for people who are used to public speaking, a business presentation can still be enhanced by a professional critique. Therefore, anyone who will be delivering business presentations frequently can benefit from presentation skills training. Currently, many of these types of training utilize new technology including video presentation software in order to assess a person’s skills as well as to provide feedback. Finally, even the last few moments before a speech should be used to prepare for an effective delivery. Most people find it helpful to review the main points before the presentation begins. This way, the information will be fresh in their minds before they begin to speak to their audience. An effective business presentation should capture the attention of the audience while informing them about the new information that they need to know. 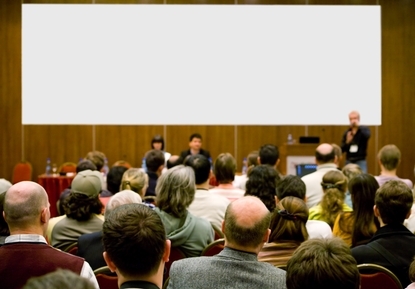 Many people initially struggle with delivering presentations. However, making sure to prepare by practicing, obtaining training and feedback, and reviewing the main points beforehand, can enable anyone to deliver a memorable speech for any business occasion.